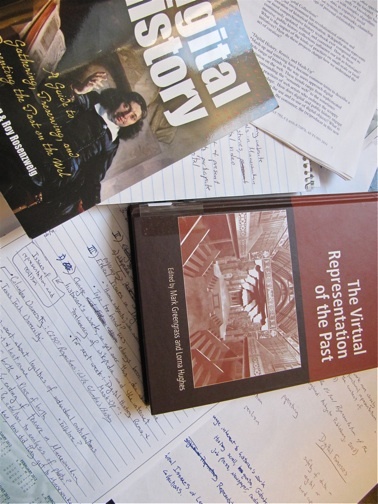 Digital History is a phrase that needs to be un-packed, but it also needs to be placed into the context of how change is inevitable in any private and professional aspect of our lives — the historical discipline notwithstanding. Some notes scribbled down in thinking about this are 1) the change that has always been central to a historian’s work, whether from Ancient Chinese historians to Herodotus and Thucydides using scrolls to the advent of the book (revolutionary since a person didn’t have to unroll meter after meter of scroll to locate a piece of information — they could just flip to the assigned page number), then the famous Gutenberg press, the individual job press (a sort of personal “blog”), the newspaper, then radio, television and then the Internet in all of its endlessly random glory. Thus, an acceptance of this change and realization that this digital web-based world is not going to go away — whether we like it, or sit in denial and cry about it in a closet — is crucial to the 2) point, which is our real and our imagined problems associated with digitally representing two and three dimensional artifacts. Are tangible, paper artifacts somehow superior to digitized artifacts, and if so why or why not? Tangible artifacts are susceptible to burning up in a fire; this as opposed to a digitized artifact that cannot be touched, but can be disseminated and copied onto an infinite number of individual hard-drives, arguably ensuring that it is preserved somewhere at all times. In our increasingly paperless society, the digitized is regarded as ephemeral and the in-your-hand paper as constant. Yet this feeds into the presumption that paper, even archival quality, is some how not ephemeral. So is it better to digitize the tangible artifacts and disseminate them across the web, thereby democratizing the access? Or is it better to not digitize the artifact and keep them safely stored in a fire-proof archive, access to them only allowed during normal business hours? (Which, by the way, coincides with your own normal business hours, making it all the more difficult to access those documents.) And finally the 3) point concerns the ethical nature and legal/copyright issues inherent to the digitization of private and seemingly public collections. In no way is this (or any) simple blog-posting meant to be exhaustive or equally representative of all the issues at stake here. It does, however, address the broad question in our digital age of access to and the sorting of information, and the ever-present human and professional need to analyze and put that information into some type of deliverable and intelligible context — whatever your job, your comrades, colleagues or co-workers will not be impressed if you just dump information onto their desk or workspace. All professions require (ideally) information to be sorted and processed in some kind of way. It continues to be up to historians (and all professionals, from automotive mechanics to physicians to lawyers) to figure out ways to remain salient as more and more information becomes increasingly accessible to larger and larger sections of the planet’s population. This entry was posted on Wednesday, November 2nd, 2011 at 11:07 am	and posted in Uncategorized. You can follow any responses to this entry through the RSS 2.0 feed.